Obtain unmodified, nucleated cells (TNCs) in 8 minutes or less – enriched by three orders of magnitude. 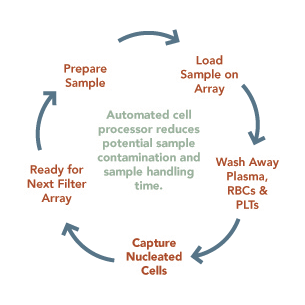 AVIVA's RedSift Cell Processor enables you to enrich nucleated cells from 4 different samples in 8 minutes or less. Select your biological material: Peripheral Blood, Bone Marrow, virtually any biological fluid. Flexibility to run 1-4 samples at once. Filter Arrays are designed for single use to eliminate contamination and ensure consistent performance. Simply discard arrays in Sharps waste container, flush the Processor with Wash buffer, and load a fresh array onto the Processor. Blood components travel in a gentle wash buffer and separate based on size, shape and conformity. No centrifuging, no harsh chemicals, no expensive antibodies. Automated liquid handler to process small volumes of blood and other fluids. Any biologic materials containing cells may be source to enrich your target cells of interest. Mix your biologic sample with AVIVA Biosciences Pre-Filtration Buffer to expand sample volume and reduce cellular aggregation and RBC stacking, or rouleaux. 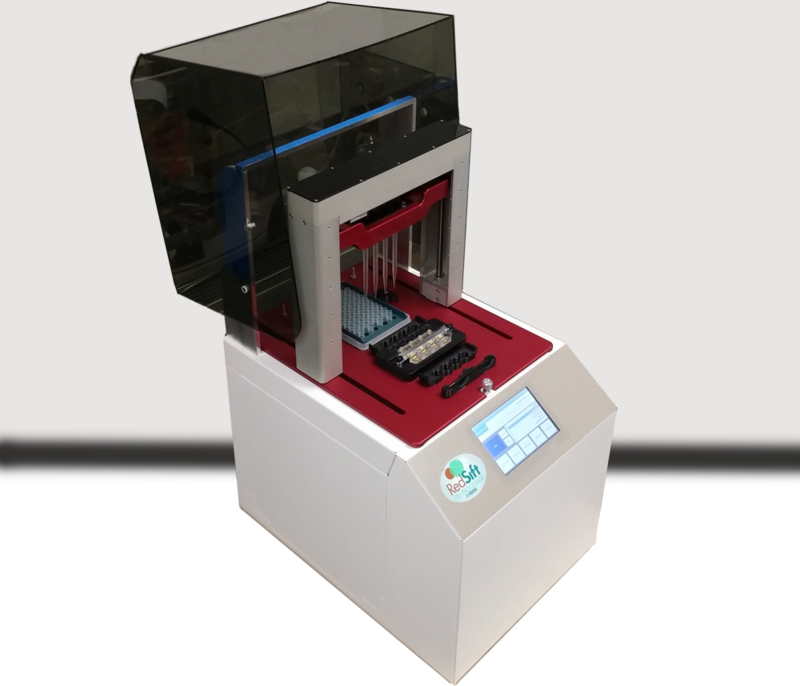 The RedSift Cell Processor loads your sample onto the filter array by automated pipetting. Select optimized procedures and programs to specify the number of nucleated cells you want to recover. RBC depletion and removal of free platelets and plasma occurs as cellular components migrate across the filter membrane and begin to separate based on cell size, shape and conformity. Filter membrane enables efficient separation as wash step removes sample of red blood cells, plasma, platelets, and other freely floating material including small molecules. This material travels out of the device into a waste reservoir. Gently enriched cells are collected back in the pipet tip. The RedSift Cell Processor transfers the nucleated cells of interest, now enriched and debulked of red blood cells, platelets and plasma, into collection tubes. Final recovery volume will vary based on volume of blood processed and procedure run. Cells are immediately ready, without additional handling or centrifugation, for downstream analysis by flow cytometry, FACS, qPCR, or next generation sequencing (NGS). The RedSift Cell Processor initiates a self cleaning cycle to flush all residual material into waste reservoir. RedSift is ready for another run to enrich nucleated cells from your next sample!